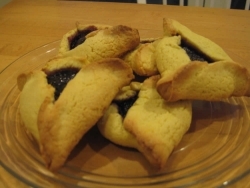 These cookies are popular among all Jews for Purim holiday. They are called "Oznei Haman" in Hebrew and "Orejas de Haman" in Spanish. Both mean "Haman's Ears" recalling the villain Haman in the story of Purim. The etymology of the Yiddish "Hamantaschen" is unclear - some saying it refers to a "poppy" confection, others linking the three cornered cookie to Haman's three cornered hat. These cookies go well with most jams or preserves as filling, or try the filling used below. Prep time does not include time for dough to rise. To prepare dough: cream butter (room temp.) with sugar until blended. Add egg, vanilla and orange juice and continue to beat until smooth. To prepare filling: Place walnuts, sugar, vanilla, lemon, orange, rum, figs, cinnamon and jam/marmalade in food processor and pulse until chopped but not pureed. Refrigerate until ready to use. To make the cookies: Roll dough on lightly floured board to 1/4 -inch thickness. Cut 3-inch circles and place 1 teaspoon filling in center of each circle. Brush water around edge of dough circle with finger, then pull edges of dough up to form a triangle around filling, pinching the 3 corners together. Bake at 375° F on a greased cookie sheet for 10 minutes until golden.